There’s only so much you can say about a sandwich with three ingredients. In this case it comes down to one word, and yes, you guessed it: delicious. 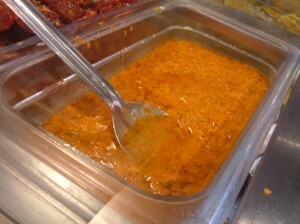 * Hot pepper flakes are combined with oil and other spices (below) and then spread on a standard, chewy Italian hero roll. 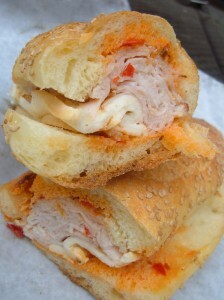 * A healthy serving of smoked turkey is sliced thin right in front of you and the smoked mozzarella follows. * The result is a confluence of flavor you’ve likely never experienced; the smokey turkey and creamy mozzarella counteract the fiery hot pepper sauce soaked into the roll. 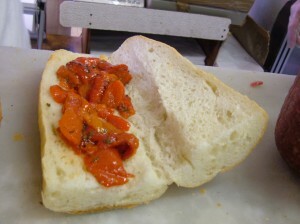 1) A healthy serving of roasted red peppers are placed on the inside of a mundane hero. The bread, unfortunately, was the weakest aspect of this sandwich. Read on to find out how to circumvent this roadblock. The roasted peppers, however, were delicious; integral to balancing the salt level of the Italian meats, these fresh, flavorful peppers are marinated in olive oil and spices. 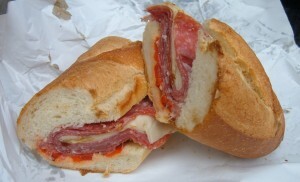 2) Silky prosciutto goes down first, followed by the slightly spicy sopresatta and garlicky Genoa salami. 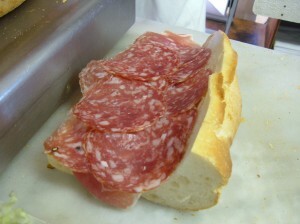 The prosciutto, already the most expensive meat on the sandwich, was by far the tastiest. 3) It all gets a light dousing with olive oil and balsamic vinegar before the roll closes around it. Below is the result. Despite the ingredients’ authenticity, it’s not the best Italian Hero I’ve ever had, that title, so far goes to Faicco’s Pork Store on Bleecker Street between 6th & 7th Avenue. Alleva has great meats and cheeses but their hero roll was definitely lacking. My recommendation, therefore, is to pick up cheese and sliced meats at Alleva and find your own bread to build a sandwich with. Balthazar, Grandaisy, Blue Ribbon, Vesuvio and Parisi are all bakeries within 5 to 10 minutes walk of Alleva. As the sign says, mozzarella cheese griddled between two pieces of moist on the inside, crispy on the outside, cornbread. At $4 per MozzArepa, it’s the perfect combo of salty, melty and sweet. I recommend you split one with a friend, however, because the MozzArepas are pretty heavy. It’s just good to get a little taste. For more of NYC Food Guy’s delicious reviews click here. Like this entry? Check out more from our Code Words contributors here. 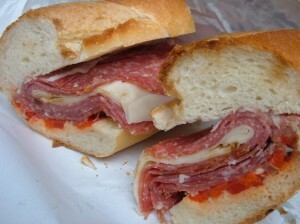 Where Do You Go For The Best Italian Sandwiches? Post A Comment Below!